Christmas is my favorite time of year. I love the lights, the colors, the smells, the sounds. I spend the month of December watching all of the Christmas movies or specials that I can DVR. Especially the ones that I grew up watching (I’m thinking about you, “A Very Brady Christmas”). But I think what I REALLY love about the holiday season is the tradition and the nostalgia. And that’s what I wanted this collection of holiday cards to reflect. While some designs still have a sense of modern whimsy, you’ll find that I used traditional colors and themes when creating these new designs. My goal is to provide you with an easy and enjoyable experience as we collaborate on a unique and high-quality product, so if you can’t quite find what you’re looking for in my shop, please message me for a custom design . Whichever route you take, let’s get started creating a holiday card that will perfectly express your family’s unique style. Visit the rest of the collection HERE. 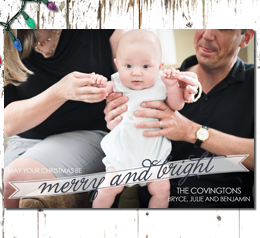 Each card may be fully customized using your images and text. Purchase the digital file and print it yourself or take advantage of my printing services and choose from a solid color, pattern or another photo for the reverse side at no additional cost. Smooth, linen, felt or pearl are your standard paper texture choices – but you may also upgrade to bamboo or cotton. Didn’t have time to gather the family for a photo card this year? No problem! Haley Bragg Designs has plenty of non-photo cards ready to personalize with your text. In addition, any of the holiday collection designs may be turned into a postcard if you’re looking for a way to cut down on postage. Features such as rounded corners and pre-printed return address labels are also available. See each listing for further details, pricing and ordering information. Once you’ve picked your Christmas card, don’t stop shopping! Haley Bragg Designs carries a full line of holiday enclosure cards, gift tags and party invitations for every occasion. Plus, with each enclosure card design you have the option of turning it into a set of stickers to attach to all of your gifts. Browse all of the invitations in the Haley Bragg Designs Etsy shop to find one that would work for your holiday party or Christmas-themed shower.